It had been very cold again overnight and we took a while getting up and moving this morning, we took so long we ended up being the last people out of the motor camp. However it was still only 9.30am so it wasn’t that bad. We are now off to the Rock and there is a certain amount of excitement in the trip, the tourist buses are building up from Alice Springs. 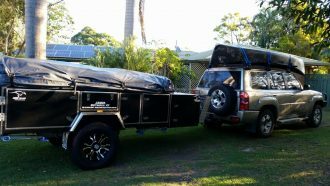 We passed our German mate, the one trying to camp in our awning, on his pushbike puffing his way along around 11.30 some 50 kilometres from the Stuart Highway. We figured it could take him a couple of days to make Uluru. 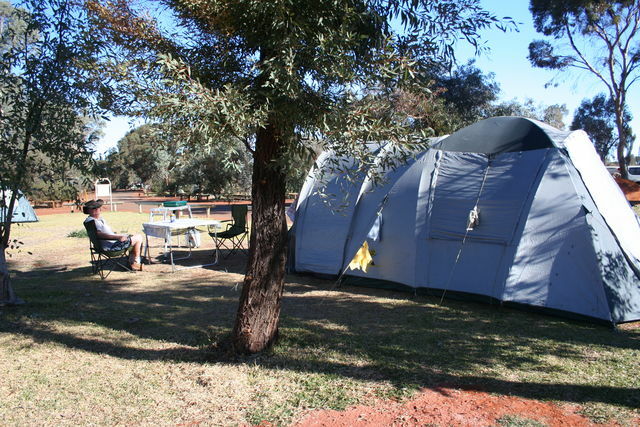 We arrived at the Ayers Rock Resort around one in the afternoon and put the tent up and had lunch. This resort is huge; it’s broken into separate hotels and accommodation types so there is everything from the five star to the unpowered camp sites with everything in between. We were planning on staying three nights here so we were able to settle in a little. In the afternoon we found our way across to the shopping centre and did a little shopping, one of the items we bought was a nice new blanket. It had been so cold at night that we hoped this would go on the air mattress to warm us from below. 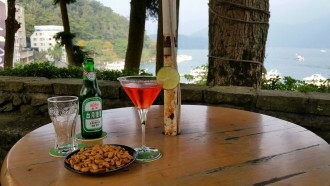 We decided on the “Sounds of Silence” trip which includes an up market dinner in the evening outside under the stars. This would mean staying an extra night to get a booking. We also decided to go for a camel ride at sunset, leaving us two days to fill in now. 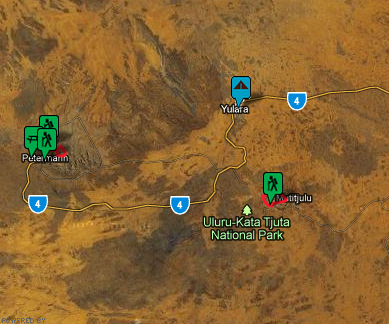 One would be occupied with a walk around Uluru and the other by exploring Kata Tjuta (The Olgas) . That done and shopping done we went to the Pioneer Motel, a back packer style hotel with a large bar and stage area as a centre piece. Here you could cook kangaroo, emu or crocodile on the BBQ. It is a cook-your-own style restaurant, you buy your meat and cook it yourself, and help yourself to salads. We ear-marked this for tomorrow night’s dinner after the camel ride. On our way back to the tent we saw a lady walking two large black dogs through the camp grounds. Behind her, following at an ever-closing pace was a dingo. There were signs around the camp warning us about these wild dogs but we had not expected to find them actually in the grounds.